Nick Bullock is a climber who lives in a small green van, flitting between Llanberis, Wales, and Chamonix in the French Alps. Tides, Nick's second book, is the much-anticipated follow-up to his critically acclaimed debut Echoes. Now retired from the strain of work as a prison officer, Nick is free to climb. A lot. 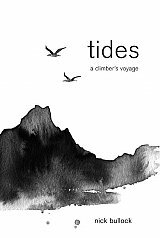 Tides is a treasury of his antics and adventures with some of the world's leading climbers, including Steve House, Kenton Cool, Nico Favresse, Andy Houseman and James McHaffie. Follow Nick and his partners as they push the limits on some of the world's most serious routes: The Bells! The Bells! and The Hollow Man on Gogarth's North Stack Wall; the Slovak Direct on Denali; Guerdon Grooves on Buachaille Etive Mor; and the north faces of Chang Himal and Mount Alberta, among countless others. Nick's life can be equated to the rhythm of the sea. At high tide, he climbs, he loves it, he is good at it; he laughs and jokes, scares himself, falls, gets back up and climbs some more. Then the tide goes out and he finds himself alone, exposed, all questions and no answers. Self-doubt, grieving for friends or family, fearful, sometimes opinionated, occasionally angry - his writing more honest and exposed than in any account of a climb. Only when the tide turns is he able to forget once more. Tides is a gripping memoir that captures the very essence of what it means to dedicate one's life to climbing.